MicroSIP allows high quality VoIP calls via the open Session Initiation Protocol to other SIP-compatible phones or regular telephones. The program is easy to configure and light on system resources and supports video, instant messaging, secure connections (via client-to-client TLS encryption) and standards compatibility. This SIP softphone is based on the Windows PJSIP stack. For regular phones, the program requires an account with a (non-free) SIP Provider. How to extract: Download the "portable" ZIP package and extract to a folder of your choice. Launch MicroSIP.exe. Always wanted to get this client to work as a P2P-client with encrypted communication, but so far I havent had any success. I can't get this software to work at all. Have reverted to PhonerLite, which has a clumsy interface but works OK. 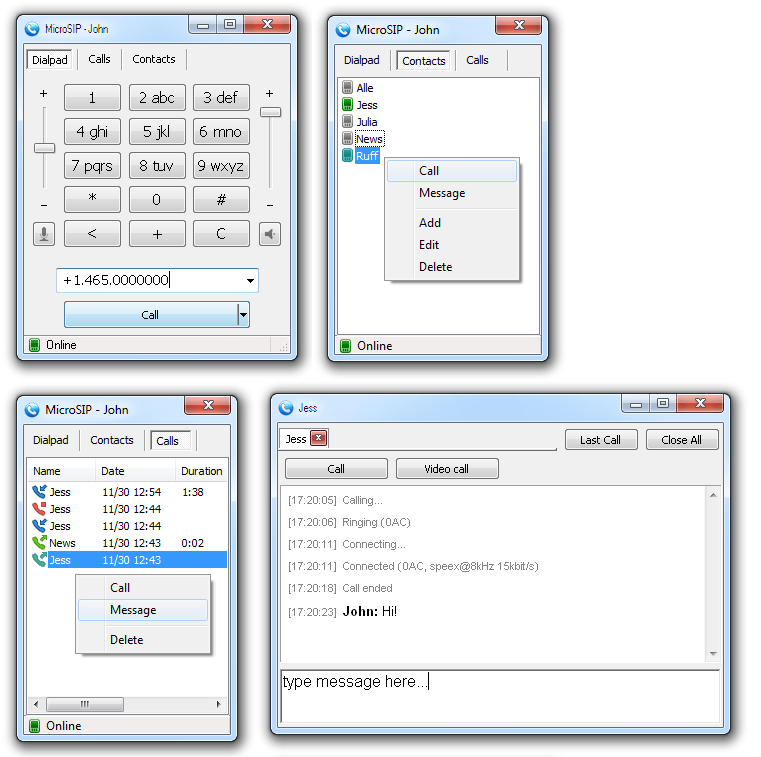 I like the neat gui for MicroSIP, but can't make outgoing calls at all, getting a 'connection timeout' message; and after answering an incoming call, can neither hear or be heard by caller. Bizarre; use the same settings as for PhonerLite, and when MicroSIP is running, it registers with my VOIP provider (Sipgate) OK, but ... zilch! There's no need to install/uninstall. It can be uniextracted. @gusi4u: If I am not mistaken, LibreOffice needs Visual C++ version 2008 only, too. MicroSIP requires MS Visual C++ runtime libraries installed in your computer, otherwise doesn't work, only 2008 version is valid, other Visual C++ packages from Microsoft (i.e: 2005 or 2010 versions) don't work.